The British White first came to notice in 1697 on the dispersal of the herd at Whalley Abbey. This herd is considered the fountainhead of the breed and was probably created by crossing a polled bull from Cleveland, in northeast England, with the 'wild' horned white cattle of the area near Whalley. These cattle went to Gisburne and then to Somerford around 1725. From there it spread to East Anglia which was for many years the center of activity for this breed. The oldest existing herd, Woodbastwick which is owned by the Cator family, is found here. The British White and White Park cattle were listed in the same herd book from 1921 to 1946 when a separate herd book was started for each. Originally two types, polled and horned, were admitted into the society, but since 1948 only polled have been accepted for registration. The cattle, as their name implies, are white with, normally, black points, nose, muzzle, eyelids, teats and feet. A few cattle have all red points, which is acceptable for registration. The British White Cattle Association of America (BWCAA) was formed in 1988 and it joins British White societies of Great Britain and Australia in promoting and registering the polled British White cattle of the world. There is much confusion in the United States between the White Park breed and the British White breed. There are three associations and cattle of the same color are accepted by all the associations. The White Park is a horned breed and blood typing of the White Park has shown it to be very distant in relation to most of the modern breeds of cattle. Sources also state that the mature White Park in Britain are, on average, 300 pounds heavier than either the British White or the American White Park. 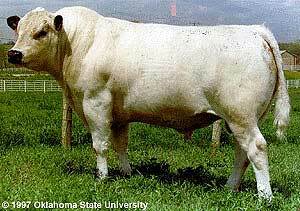 The British White is polled (genetically hornless), docile and was a dual purpose breed (beef and milk) until 1950. Since then the British Whites selection has been for beef production with carry over heavy milk production. 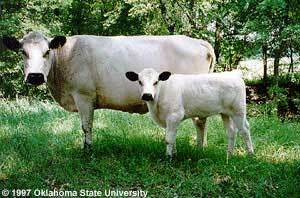 The American British White cow is of moderate size, 1000 to 1500 pounds. Bulls are from 1800 to 2300 pounds. They are smooth polled although an occasional "scur" is observed. Both bulls and cows are very docile in nature. The cow udders are well set and tight with small black teats. Back lines are straight and strong with a slight slope to the tail head. The bull's scrotums are well shaped and large in size, a 38-42cm circumference in yearling bulls is normal. 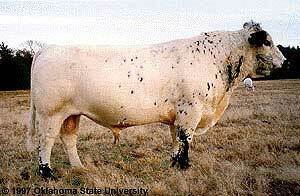 British White Cattle Association of America, PO Box 281, Bells, TX 75414-0281. Phone: (903) 965-7718 provided by Dr. Michael L. Thonney, Professor of Animal Science, Cornell University.